Ripple Effects: Will The Brexit Vote Lead To The Breakup Of The U.K.? 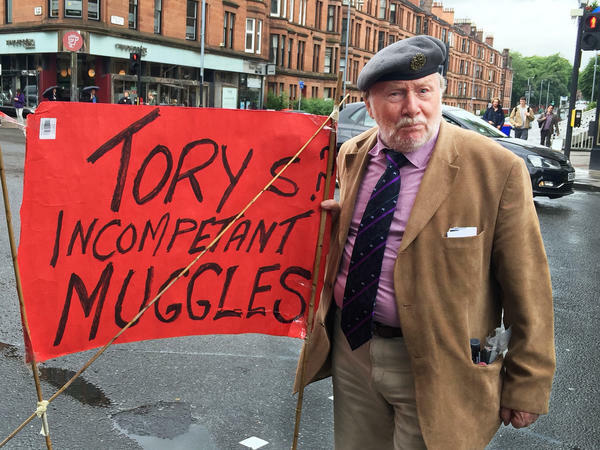 Harry McEachan, a former baker and auto factory worker in Glasgow, is furious with the Conservative (also known as Tory) Party for engineering a successful Brexit vote. McEachan plans to vote for Scottish independence if there is a second referendum. Demonstrators in Edinburgh gather outside the Scottish Parliament, which was discussing the implications for Scotland of the U.K. vote last month to leave the European Union. When Maggie Ranage woke up to the results of last month's vote to leave the European Union, she couldn't believe it. "I just thought, 'Are they nuts? This is bonkers!' " says the Scot, who teaches art and English as a second language at the University of Glasgow. In 2014, during Scotland's independence referendum, Ranage voted to remain in the U.K. She thought Scotland, England, Wales and Northern Ireland would be "better together," as a campaign slogan at the time promised. But the Brexit vote has her so mad, "if there's another referendum, I'm going to be voting out," she says. Tremors from the political earthquake that is Brexit continue to reverberate, particularly in Scotland, where people voted overwhelmingly to stay in the European Union. Many Scots are angry. They feel they were out-voted by the English, who outnumber them by about 10 to one. Scots are now talking about holding a second referendum to declare independence from the U.K.
"I don't want to be part of England," says Ranage, who was enjoying beers with friends at a pub just off campus this week, "because I really would like not to be ruled by English people." You hear this kind of frustration across Glasgow, Scotland's largest city, in places such as Buchanan Street, a pedestrian area where musicians play everything from jazz to bagpipes on summer evenings, which are typically overcast and chilly here. "We thought it was incredibly unfair," says Daniel Everett, 17, who was strolling along the street in a hoodie earlier this week. Everett, who just graduated from high school, was too young to vote on Brexit, but he really wanted the U.K. to stay in the EU. He was looking forward to taking advantage of access to the EU's single market so he could spend a semester on the European continent. Everett felt the Brexit referendum wasn't fair to Scotland. "Scotland voted to remain and that's a democratic vote," Everett says. "A lot of the smaller nations feel they weren't heard." Nicola Sturgeon, the First Minister of Scotland and leader of the Scottish National Party, said after the Brexit vote that a second referendum to leave the U.K. was "highly likely." Everett and many other nationalists here say if they get another chance, they'll vote for independence and they expect the referendum to pass. Not everyone here in Glasgow, though, is convinced. "I don't think there'll be another Scottish referendum," says David Leask, who works for the local newspaper. "Scotland originally voted to stay a part of the U.K. and I don't see it changing now." Leask says one reason is financial. A few years ago, energy from the North Sea provided nearly 20 percent of the revenue for Scotland's government. About three months before the 2014 vote, crude oil was selling for more than $100 a barrel. Since then, prices and government oil revenue have plummeted. In the run-up to the 2014 vote, the Scottish National Party painted a rosy financial picture of independence. "They promised all kinds of things to all kinds of people," says Thomas Lundberg, who teaches politics at the University of Glasgow. Lundberg says given the changed financial conditions, the party needs to be much more realistic with voters in any campaign for a second referendum. "If you raise people's expectations, which the SNP did the last time, and you fail to deliver, there could be a big problem." For all the talk in Glasgow of the inevitability of a second independence referendum, few expect one anytime soon. "People are slightly referendum-ed out," says Murray Pittock, a cultural historian of the British Isles at the University of Glasgow. "The polling evidence is that a small majority of people don't want a referendum right now," says Pittock, "and a small majority would vote for Scottish independence if there was one." In other words, after the most dramatic period in U.K. politics in decades, the Scots, like practically everyone else here, need to catch their breath and think about the future of this nation. Of course, that report is landing as many in the United Kingdom are still figuring out what it will mean to be out of the European Union. In one part of the U.K., Scotland, most people want to stay in. And there could be a way to do that. Scots are now talking about holding their second referendum in recent years to declare independence from the U.K. NPR's Frank Langfitt reports from Glasgow. FRANK LANGFITT, BYLINE: When Maggie Ranage woke up to the results of last month's vote, she couldn't believe it. MAGGIE RANAGE: I just thought, are they nuts? This is bonkers. And so, although the last time I voted to be part of the United Kingdom, if there's another referendum, I'm going to be voting out. LANGFITT: Ranage spoke at a pub near the University of Glasgow, where she teaches art. In the 2014 referendum here, she backed staying in the U.K. She thought Scotland, England, Wales and Northern Ireland would be better together. It was a campaign slogan at the time. Now, Ranage doesn't buy all that unity talk. RANAGE: I don't want to be part of England. LANGFITT: What makes you not want to be a part of it? RANAGE: Well, because I really would like to not be ruled by English people. LANGFITT: You hear this kind of frustration across Glasgow, Scotland's largest city, in places like Buchanan Street. DANIEL EVERETT: We thought it was incredibly unfair. LANGFITT: Daniel Everett is 17, just graduated from high school. Although Everett was too young to vote on Brexit, he really wanted the U.K. to stay in the EU. EVERETT: We feel, as a nation - Scotland, as a nation - Scotland votes to remain, and that's not happening. That - we don't feel that's a democratic vote. So lots of the smaller nations feel as though their voices weren't heard. LANGFITT: Nicola Sturgeon, leader of the Scottish National Party, said after the Brexit vote that a second referendum to leave the U.K. was, quote, "highly likely." Everett and many other nationalists here say, if they get another chance, they'll vote for independence. They expect the referendum to pass. Not everyone here in Glasgow, though, is convinced. David Leask works for the local newspaper. DAVID LEASK: I don't think there'll be another Scottish referendum, no, for the simple reason being Scotland originally voted to stay part of the U.K., and I don't see it changing now. LANGFITT: Why not, do you think? LEASK: I think the simple reason being financially. I think it'd be very foolish considering they were putting - I think at the start, they were putting everything on having the oil revenue to take Scotland forward, and we don't have that. LANGFITT: A few years ago, energy from the North Sea provided nearly 20 percent of the revenue for Scotland's government. Back then, the Scottish National Party painted a rosy financial picture of independence. Tom Lundberg, who teaches politics at the University of Glasgow, explains on Skype. TOM LUNDBERG: They promised all kinds of things to all kinds of people - all kinds of free things that somehow we would be able to afford as an independent country. And they were looking at very high oil revenues when they were making these calculations. LANGFITT: About three months before the 2014 vote, crude oil was selling for more than $100 a barrel. Since then, prices and government oil revenue have plummeted. Lundberg says, in the second referendum, the party, which everyone calls the SNP, has to be much more realistic with voters. LUNDBERG: If you raise people's expectations, which the SNP did the last time, and then you fail to deliver, there could be a big problem. LANGFITT: And any new vote on independence isn't expected anytime soon. MURRAY PITTOCK: People are slightly referendumed (ph) out. LANGFITT: Murray Pittock is as a cultural historian of the British Isles at the University of Glasgow. He says the independence and Brexit vote have exhausted Scots. Most aren't ready for another. PITTOCK: The polling evidence is that a small majority don't want a second referendum right now, and a small majority would vote for Scottish independence if there was one. LANGFITT: In other words, after the most dramatic period in U.K. politics in decades, the Scots, like practically everyone else here, need to catch their breath and think about the future of this nation. Frank Langfitt, NPR News, Glasgow. Transcript provided by NPR, Copyright NPR.